Home / Rabbit Cages / Which Are the Best Rabbit Cages to Buy for Your Rabbit? 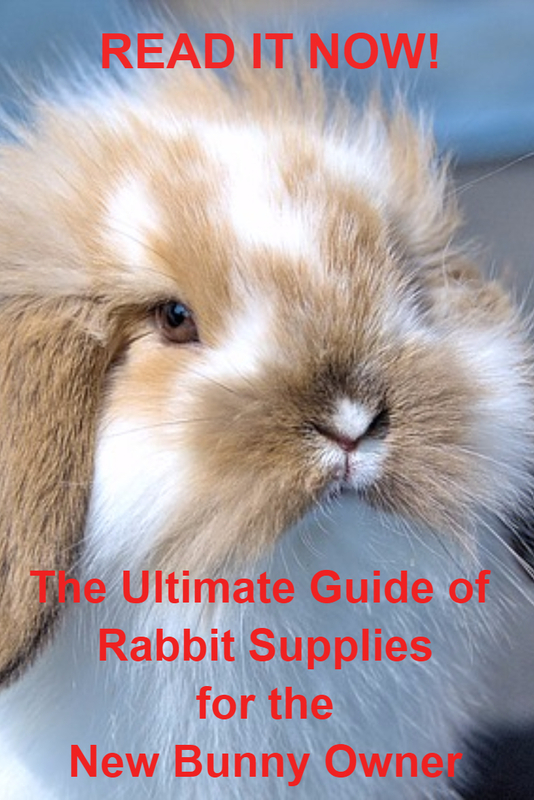 So, what should you be looking for when searching for rabbit cages for your indoor bunny? Is it big enough for your bunny at adult size? Does it allow ample room for your bunny to lie down without lying in its waste or without knocking food or water containers off the cage? Can your bunny hop around inside the cage a little bit? These are some of the considerations we used when evaluating rabbit cages. 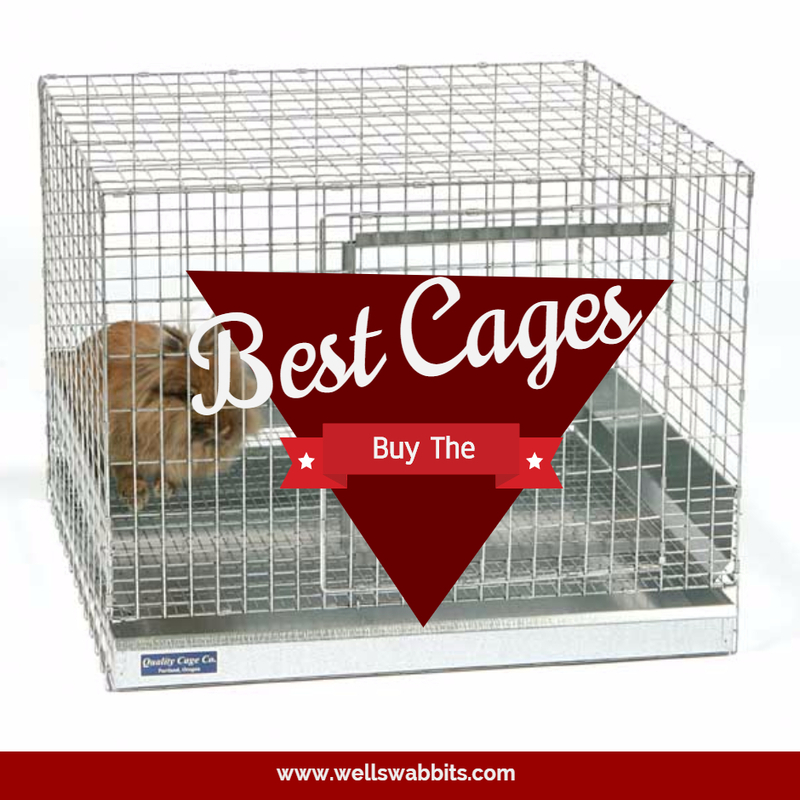 The following cages are all rabbit cages that we feel like would be good cages to consider buying for your rabbit(s). This rabbit starter kit is probably one of the most common rabbit cages that new rabbit owners purchase. We have one although most of our rabbits stay outside in custom rabbit hutches my husband built for me. 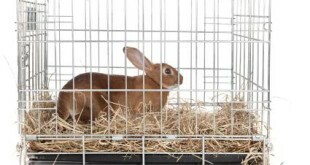 This rabbit cage is one that we use as our quarantine cage whenever rabbits are just purchased and whenever we suspect that one of them is sick. It is the perfect size for dwarf rabbits and baby rabbits of larger breeds. Once a rabbit gets up to about 3 lbs. at adult weight, though, this cage would probably be too small for them. One of the things that I really like about these types of rabbit cages are that they are very easy to clean out. I can literally have the cage cleaned out and scrubbed in under 10 minutes. This kit also comes with things like a water bottle, a food bowl (which you’ll want to use for something else and just buy a clip-on food container (like a j-feeder) so that your rabbit doesn’t spill the food by flipping the bowl up in the air with its teeth), a chew treat, food, bedding, and a toy. I would ditch the bedding that comes with it, and go buy a bale of hay from your local food store, and use it so that your bunny doesn’t try to eat the bedding. Although the bedding does absorb more urine and mask the smell, if they swallow the bedding, they will very likely end up with a blockage in their stomach or intestines. The only negative that I don’t like about this cage are that the urine does tend to pool up under the hay very quickly since there is a solid bottom on this cage with no pan underneath it. 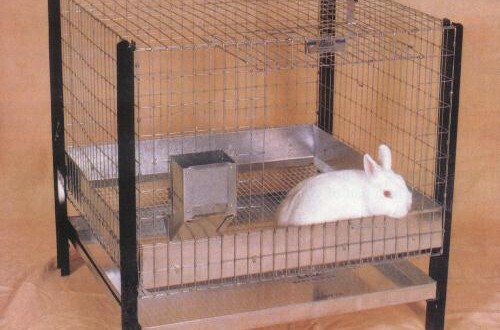 Cages with a wire bottom and tray underneath it are more sanitary for the rabbit. And, as long as you provide a solid resting board for your rabbit to stand and lay on, their paws won’t get sore. Other than that, I really like this rabbit cage. We don’t have this cage, but I know some aquaintances who do. These are very solid rabbit cages, although when compared to the the Ware cage above, I do like the fact that this cage comes in two sizes of rabbit cages. It comes in the size pictured here, and in one that could house a larger rabbit that is 37″ wide. This cage has a grid mesh floor with a plastic tray underneath it that can be pulled out for cleaning. For this reason alone, I would rate it higher than the Ware Manufacturing starter kit. The other thing that is nice about this cage is that it opens from both the top and the sides. Sometimes, it is much easier to retrieve your rabbit by reaching down in through the top of a cage in case it is trying to be evasive. We have a cat carrier that we have had to stick a rabbit into during storm season when we were packing our entire herd of rabbits down into our storm cellar with us (we live in Oklahoma). Those carriers open from above, and I noticed that the rabbits were easier to get out. The only negative to this cage is that there is no ramp or ledge for bunny to climb up on and look out from higher up, and there is no area for it to hide, which bunnies like to do. However, over all, this is a very solid, strong, sturdy built cage, and I would highly recommend it. I love this cage’s size. It’s enormous! If you have a larger bunny breed, you could let your bunny stay in this cage, and he/she would have plenty of room. Another thing that I love about rabbit cages like this one are the ledge and the little hidey hole that is provided. This cage has a ramp with a little ledge that they can hop up onto and see out. One of my indoor cages has a ramp like this in it, and my bunny loves to sit on top of the ledge and just hang out. It gets her above the lip of the cage so that she can truly look out into the room and see everything. One thing that this cage has that none of other cages has is a hidey hole. Rabbits enjoy getting away from everyone and having alone time. They also really like having a place to hide when they’re scared. You have to remember that they are a predator animal that is easily spooked by loud noises, kids, other animals, and sudden moves. Providing them with a place to hide is very important to make them feel safe. This cage also opens from the top and side, which is a big bonus. This will allow you to have an easier way to put your rabbit into and take it out of the cage. This cage does not have a wire floor, so you will have to clean it more often than the Midwest Wabbitat cage. However, with the bonus of this cage having not only a ledge to sit on, but also a little hidey hole, this cage should be a big contender as you consider what cage to buy. This cage comes with caster wheels, which are removable if you don’t want wheels on the cage. The Bunny House also has doors that open from both the top and the sides, making it easy for you to get your bunny out. This cage has a wire mesh floor with a plastic tray underneath it, which is great for keeping your bunny out of the urine so that its feet stay dry. Because it does have a wire floor, however, you will want to make sure that you insert some wooden boards into the cage so that it will have a flat resting area so that it is not standing on wire all day. This will also give bunny something to chew on and wear down its teeth. The Bunny House would be good for dwarf size rabbits, but would probably be too small for larger breeds of rabbits. Out of all of these rabbit cages, my personal favorite cage is the Living World Deluxe Pet Habitat, X-Large rabbit cage. This cage has a ledge for your bunny to hop up on and either sleep or see out into the rest of the room. And, it has a little hidey hole so that your bunny can get away from everyone when it wants. It also has entrances from both the top and side, making it easy to remove and put your bunny back into the cage. The X-Large cage also gives bunny a ton of room to hop around in the cage. For the money, this cage hits most of the important points to look for in a bunny cage. So, this cage is my recommendation. 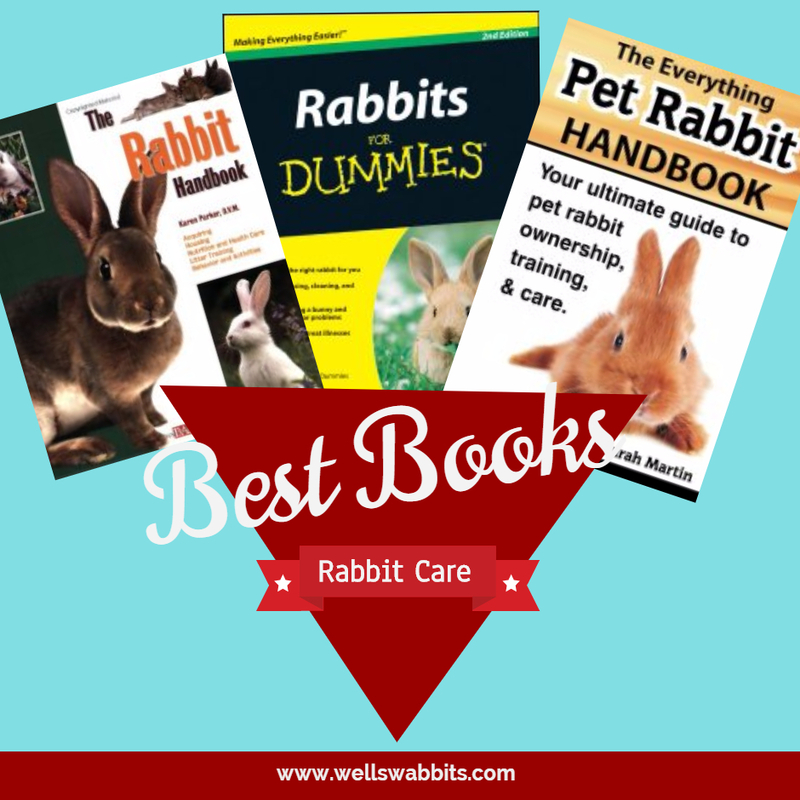 Next Which Rabbit Care Books Should All Rabbit Owners Have?